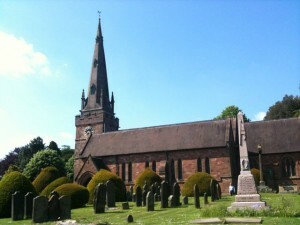 On 8th July, we performed at the Holy Cross Church in Bobbington. 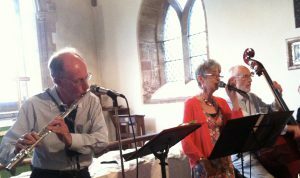 Half way through, the concert included a Jazz Trio. 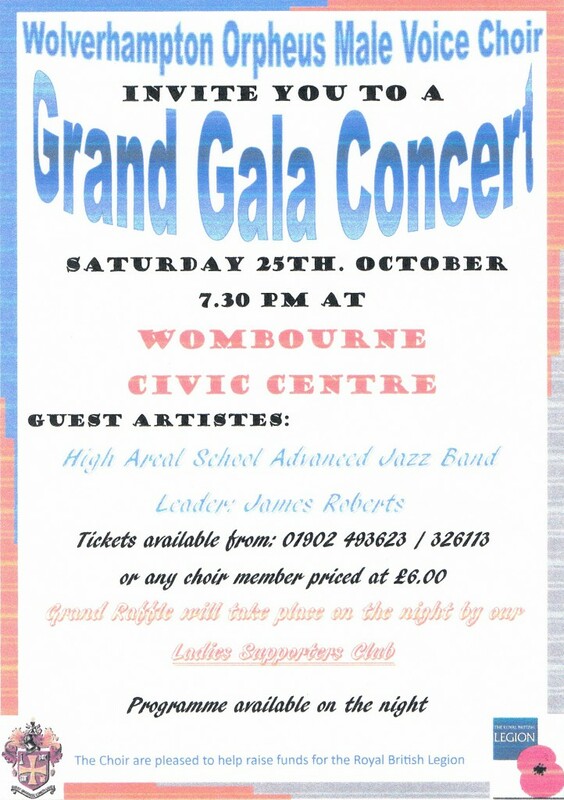 On the evening of Saturday 25th October 2014, we held our Grand Gala Concert at Wombourne Civic Centre. Our special guests were High Arcal School Advanced Jazz Band led by James Roberts. The band was started about 10 years ago. In this time they have enjoyed a lot of success in regional and national competitions & events. They have won numerous Gold & Platinum awards at the National Concert Band Festival and have been invited to perform in Music for Youth’s National Festival at Adrian Boult Hall at Birmingham Conservatoire. 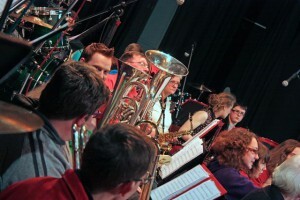 The band also perform in various concerts in school and may be booked to play at events in the wider community. E.g. 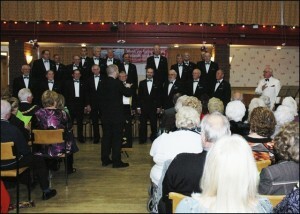 they have performed at Brierley Hill Civic Hall. 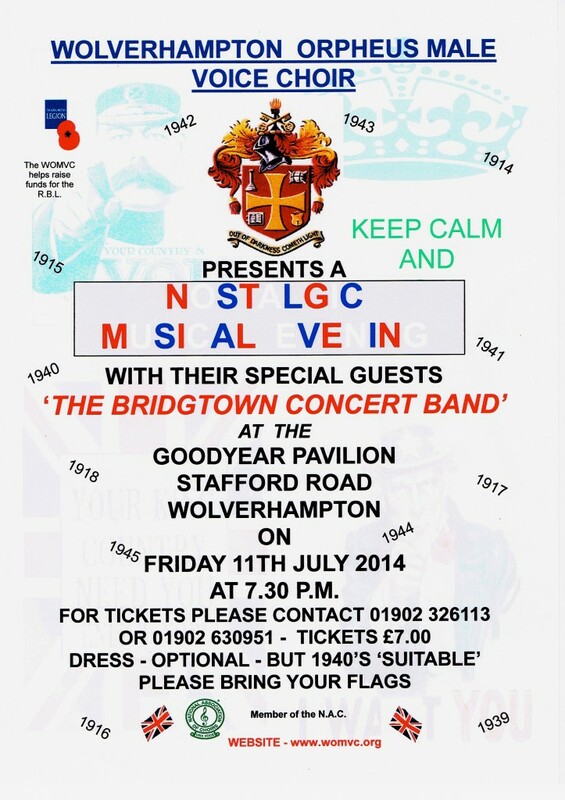 We held a ‘Nostalgic Musical Evening’ at The Goodyear Pavilion in Wolverhampton on Friday 11th July 2014 commencing at 7.30 p.m. 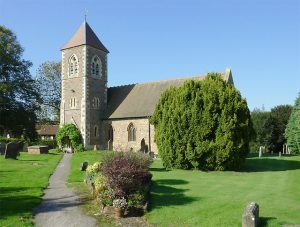 This event started the choir’s contribution in both celebrating and in memory of the 1st and 2nd World Wars – given in song, using music from both eras – to bring back both good and sad memories of those times. Our Musical Director, Mr Graham Hancox compiled appropriate pieces for the evening’s entertainment. The programme included ‘Lest we Forget’, ‘What a Wonderful World’, ‘Over the Rainbow’, ‘A Nightingale sang in Berkeley Square’, ‘The way you look tonight’, ‘The White Cliffs of Dover’, a Perry Como medley, ‘The Rose’, ‘Let there be peace on Earth’, a medley of First World War songs, an Al Jolson medley and The Dambusters March. VIP guests included the current Mayor and Mayoress of Wolverhampton and our Honorary Patron Lady Bilston; Pat Turner, who sadly lost her husband, Lord Bilston (who was joint Honorary Patron) earlier this year. We had the pleasure of featuring The Bridgtown Concert Show Band, who entertained us with their own material, as well as accompanying the choir for a few pieces. We encouraged those attending to ‘dress up’ in the 40’s style and bring Union Jack flags to wave in a good old sing-song. We are pleased to announce that on 29th January we signed a new 2 year Community Compact agreement with The Royal British Legion (Staffordshire County region.) 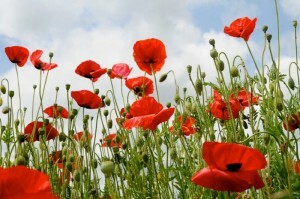 During 2014 & 2015 we will raise funds for The Royal British Legion. During the First World War Centenary it is appropriate that we will be supporting a charity that in turn supports those that serve & have served our country in the Armed Forces. 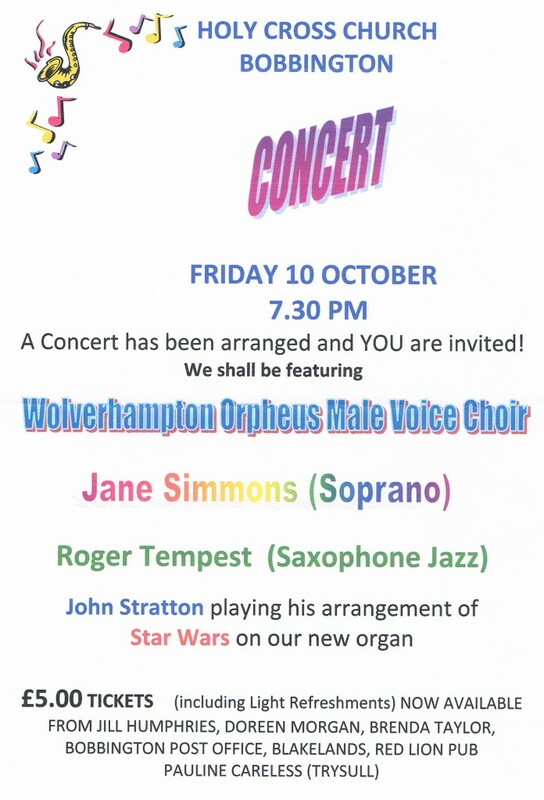 Extract taken from Wombourne Music Festival 2013 article written by Richard Hill for St. Benedict Biscop Church. 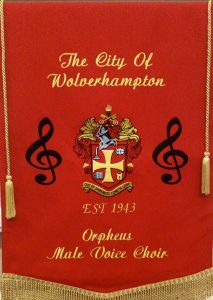 In the evening we had the delight of Wolverhampton Orpheus Male Voice Choir, and that was another pleasure. They were well rehearsed, effortless and with a narrator (compére) of clear diction and some wit. This was easy listening of the finest quality with such clear enunciation. The performance of ‘How Great Thou Art’ at the end of the evening was so well done. 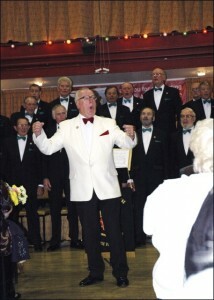 The choir’s Grand Gala Concert was staged at Wombourne Civic Centre on Friday 19th October 2012 at 7.30pm.